With an emphasis on unique taste and endless combinations, Pita Pit USA looked to evok to position their franchise as the ultimate flavor experience. Our objectives included building awareness of Pita Pit while generating trial from new guests, as well as encouraging additional visits from existing pita fans. To accomplish this, we began by understanding, getting to know and connecting with our primary audiences. Our brand strategy development began by cooking up a new and unique tagline, as well as establishing the elements of a strong, consistent and cohesive brand—its essence, value proposition and promise. To showcase Pita Pit’s fresh and flavorful food internally, the evok team planned and directed a branded photoshoot at a renowned food photography studio and used the custom photography throughout creative collateral introducing the updated brand. Once the updated brand and elements were finalized, they were presented in a manifesto video to be played for franchisees at Pita Pit’s annual conference. Even the strongest brand message can fall flat without flawless delivery to the best and most receptive audiences. To ensure the Pita Pit message was heard loud and clear, we leveraged third-party QSR research, as well as our own online data sources, to identify our ideal consumers. These consumers were then further segmented into Pita Pit’s target personas, as we dug deep into their interests, demographics, psychographics and more. Once we knew who our message would resound with, we utilized our programmatic planning platform to produce quantifiable target audiences we could then serve branded touchpoints through digital channels. Targeting a 5-mile radius around each of Pita Pit’s 240 restaurants nationwide, we were able to reach hungry young families, recent grads and university students with a nearby Pita Pit. 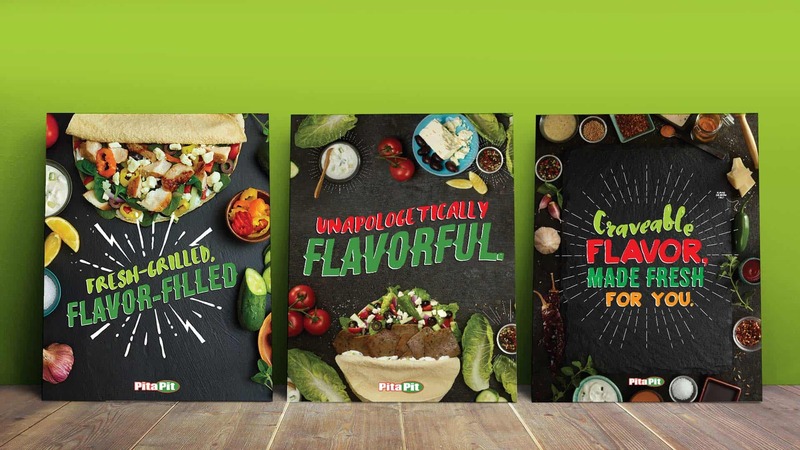 With every flavor ambassador (Pita Pit employee) on board and excited by the evolving brand identity and strategy, it was time to debut fresh creative across restaurant on a national level. This included t-shirts, cups, pita wrappers, in-restaurant signage and décor as well as a 30+ foot wall mural. The Pita Pit personality is one in a million, and it’s evok’s job to make sure it shines through on social media. With a dash of bold and unique and a sprinkle of spicy, the evoking social team is the voice behind Pita Pit’s Facebook, Instagram and Twitter accounts. Day in and day out, our team focuses on building brand awareness, fostering an engaged community and promoting menu items and limited-time offers. 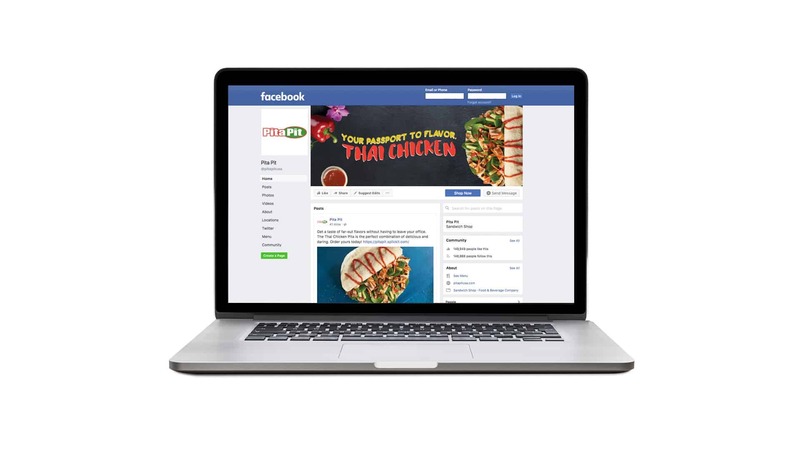 Throughout our time monitoring Pita Pit’s social accounts, we’ve learned that Facebook marketplace ads and promoted posts are influential to their audience growth, brand awareness and heightened engagement, and videos, food photography and lifestyle focused imagery garner the most engagement. 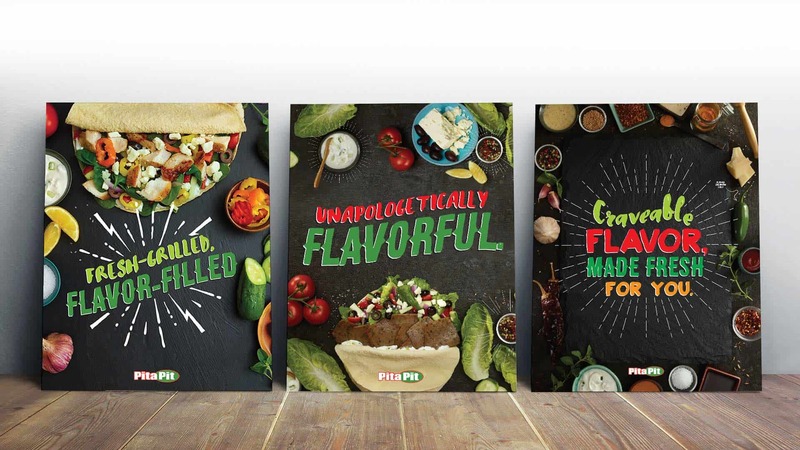 As a full-service agency, evok supports Pita Pit with all quarterly promotions from conception to implementation of digital media creative, social media posts, email marketing and in-restaurant signage. 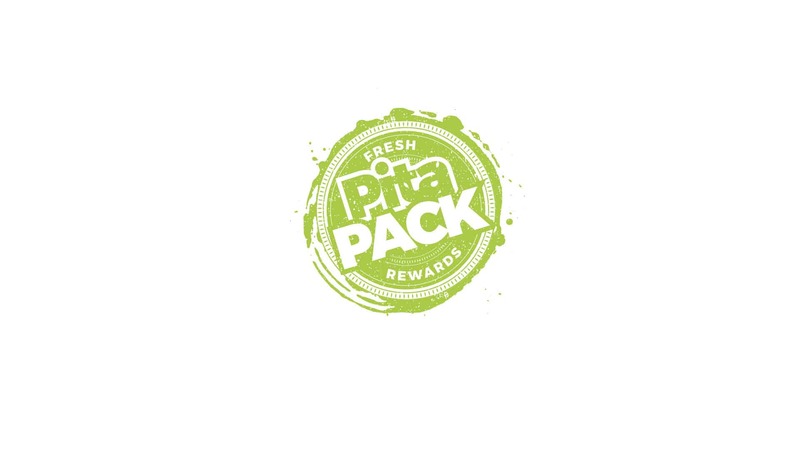 With every quarter comes a new campaign at Pita Pit accounting for four fresh and tasty promotions every year. 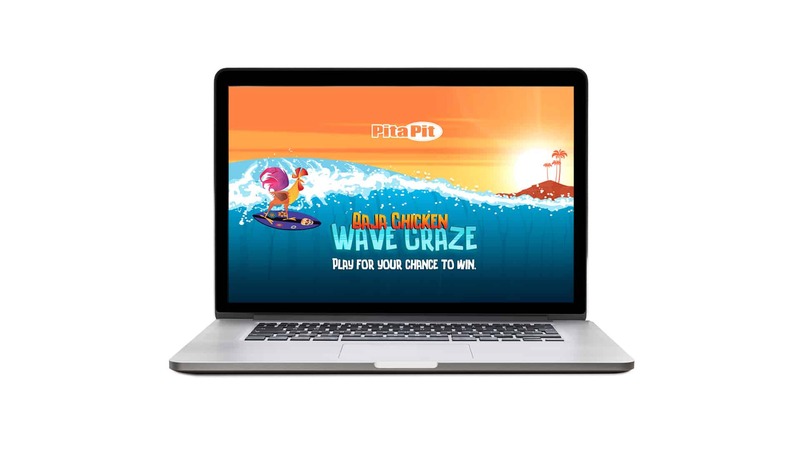 Some of our most famous promotions include our Pita Fit campaign that launched in the new year promoting healthy living and eating (pitas) and our Thai Chicken and Baja Chicken Bacon Ranch limited-time offer campaigns with accompanying online interactive games. Utilizing Pita Pit’s target personas, we optimize our digital media campaigns in real time using algorithm and insights pixel. 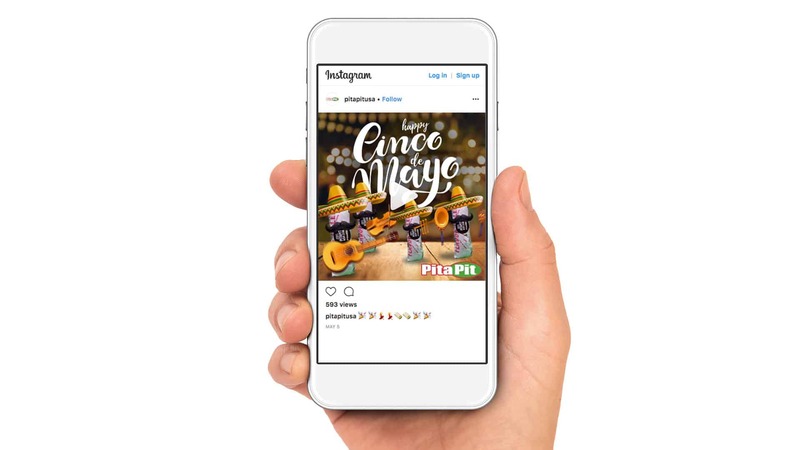 Our team creates programmatic banners ads showcasing Pita Pit’s quality ingredients, vibrant produce and fresh-off-the-grill flavor and run them during quarterly promotions or in specific markets throughout the year. Looking to target specific consumers and personas, our team ran a highly successful app targeting test. We researched and collected data on consumers who previously downloaded competitor’s apps, such as Jimmy John’s and Chipotle, and food delivery apps, such as UberEats and Doorstep Delivery. With a geo-fence to 5 miles or less around the restaurants, we served these consumers banner ads across their linked devices. With a strong call to action, once users clicked on the banner ad, it led them to a landing page to save $2 off their online order. 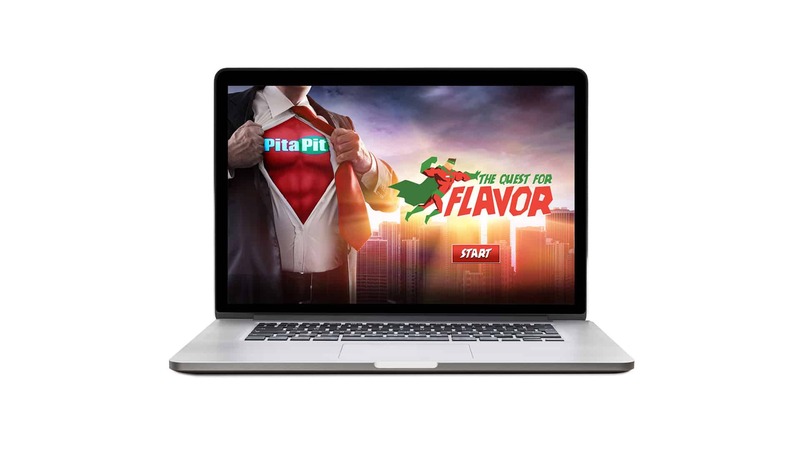 Designing interactives games in house at evok lends Pita Pit a creative twist to push consumers to try limited-time offers. 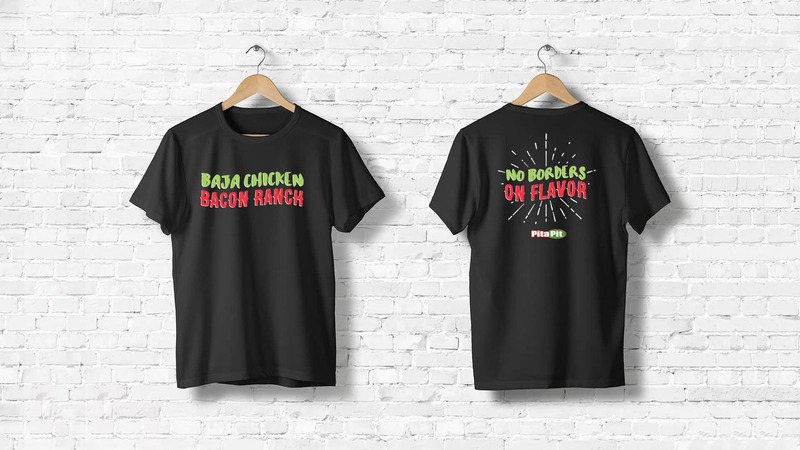 With our Baja Chicken Bacon Ranch limited-time offer, our interactive team created the “Baja Chicken Wave Craze” where users rode the wave, chowed down on pitas to earn points and avoided unhealthy fast food items like burgers or pizzas. After the game, Pita Pit awarded players with a $1 coupon to try the Baja Chicken Bacon Ranch pita. With the same concept in mind, we launched the “The Quest for Flavor” during the Thai Chicken limitedtime offer campaign. We created this game in a sidescrolling platform—think Super Mario Bros. or Sonic the Hedgehog—where users played a superhero flying through the city collecting healthy pitas and dodging stereotypical fast foods.